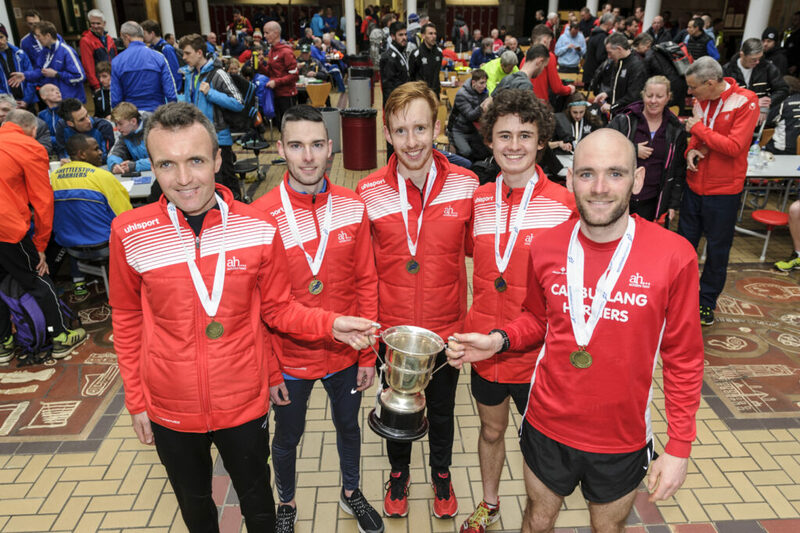 Cambuslang Harriers and Central AC savoured the moment at Livingston as they carved out success once again in the National Road Relays. 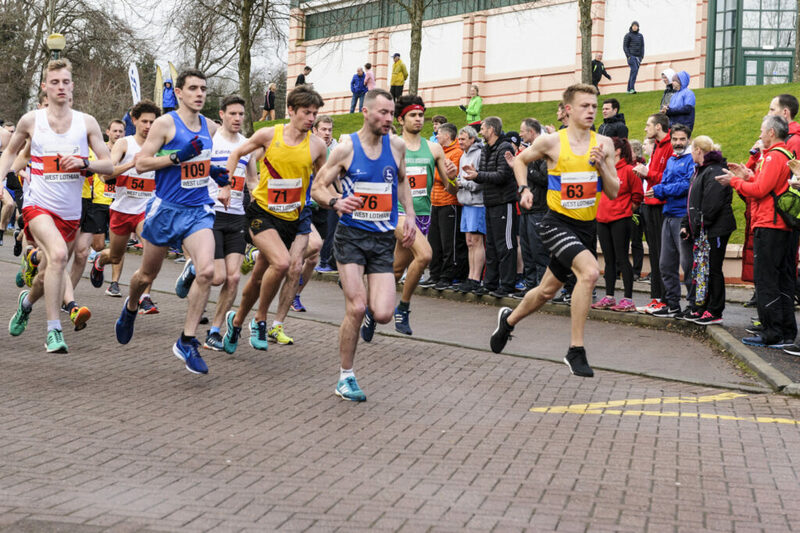 It was a second win in four years for Cambuslang in the men’s race as they proved too strong for the chasing pack in windy conditions at Livingston to repeat their 2016 win. 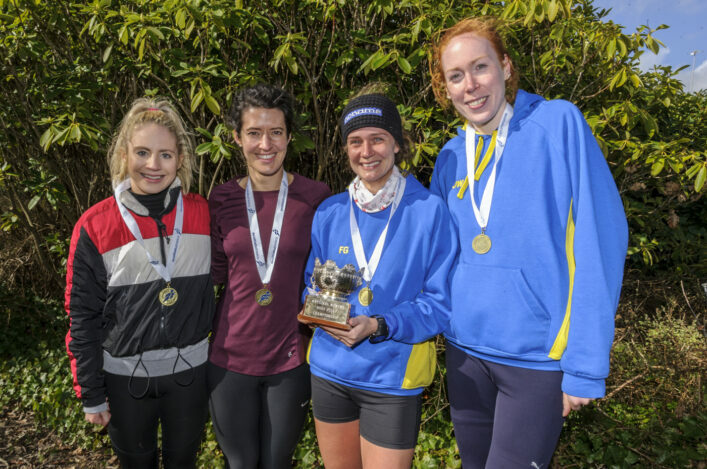 Central AC women are no strangers to the top of the podium, either, and their winning team once again had familiar faces like Jenn Wetton and Morag Millar as well as Fanni Gyurko on the anchor leg. Cambuslang opened up with youngster Drew Pollock on the first leg followed by Kevan Harvey in the first of the three long legs. 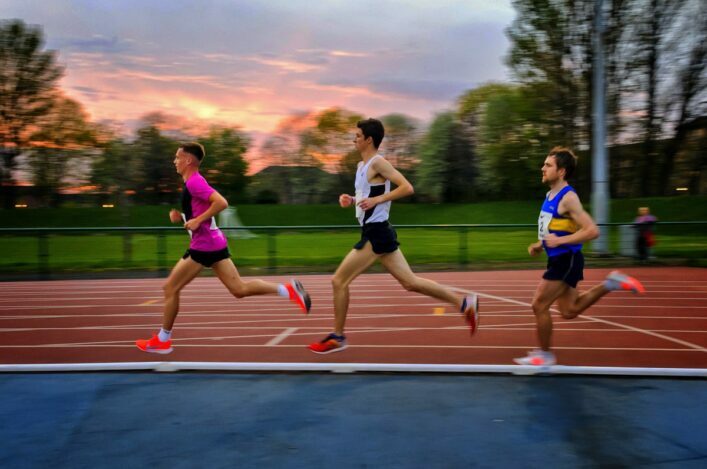 Powerful performances mid-race by Stuart Gibson (short leg) and Ryan Thomson (long leg) had them well clear and Gavin Smith was able to hand over a lead of around one minute at 50 seconds to final runner, Fraser Stewart. Behind Stewart, with the winning margin ending up at one minute 12 seconds as the Glasgow club clocked 2.16.55, there was a terrific battle for the other medals. Andy Douglas, on the anchor for Inverclyde AC, duly led them to silvers by only two seconds in 2.18.07 from Calum McKenzie’s Corstorphine AAC – who recorded 2.18.09 – and fourth-placed Shettleston (Lachlan Oates). With bronze medals, holders Corstorphine were thus on the podium for the second year in a row. On the opening leg, Luke Traynor (Giffnock North) had a terrific run to as he prepares for the World Cross in Denmark next week. Luke’s 14.59 was the fastest short leg with McKenzie’s 28.56 the quickest on the long legs. Luke Traynor (Giffnock vest) leads out the opening leg of the Men’s race (all photos by Bobby Gavin). ‘It was a great effort by all the boys and they gave me a really strong position to defend on the anchor leg,’ said Stewart, who clocked 29.50 on that last leg. ‘Mind you, with guys like Lachlan Oates, Andy Douglas and Calum McKenzie coming behind me I knew I would need that advantage. It was a case of getting the head down and trying to get the job done for the team and thankfully I was able to do that. Stewart is a convert to athletes from football after joining Cambuslang only some 18 months ago after playing amateur with Eaglesham. ‘I ran the Skye Half Marathon a couple of years ago and ran 79 minutes,’ he said. ‘I decided to take it up a bit more seriously and started training with John Montgomery’s group in Glasgow. I joined Cambuslang about 18 months ago and it’s been really enjoyable to be part of the club. Cambuslang Harriers celebrate thanks to the efforts of (L-R) Stuart Gibson, Kevan Harvey, Ryan Thomson, Gavin Smith and Fraser Stewart. Drew Pollock was absent for the medal ceremony. Central AC women saw off the challenge of silver medallist Shettleston Harriers and bronze medallists, Edinburgh Uni Hare and Hounds. Rebecca Craig, a student at Stirling Uni, led them off before the experienced trio of Wetton, Millar and Gyurko made sure of another success for coach Derek Easton. Central recorded 1.44.45 to win by 54 seconds from Shettleston, who had Fionnuala Ross on their last leg. Millar’s 17.04 was almost a full minute quicker than anyone else on the short legs. Kilbarchan’s Elspeth Curran led the way with 32.35 on the long legs. ‘I’m thrilled to win a National team gold medal once again because I didn’t think that would happen again,’ said Wetton. ‘I’ve had Achilles injuries over the past four years or so and also took time out to have a baby. But I’m getting back to better fitness now and I am training for the Scottish Marathon Champs at Stirling. ‘Morag has had knee issues, too, and both of us have been trying a new ‘cure’ called shockwave treatment via a physio – it seems to be working! ‘My son is 13 months old now but it is hard when you are a new mum and you are trying to train with less time available. And less sleep! I did the 10 different parkruns back in the autumn and actually that was a good route back for me at the time, getting those under 20 minutes. ‘Rebecca is the daughter of a Kilbarchan AAC coach who is at Uni in Stirling and came along to our training. 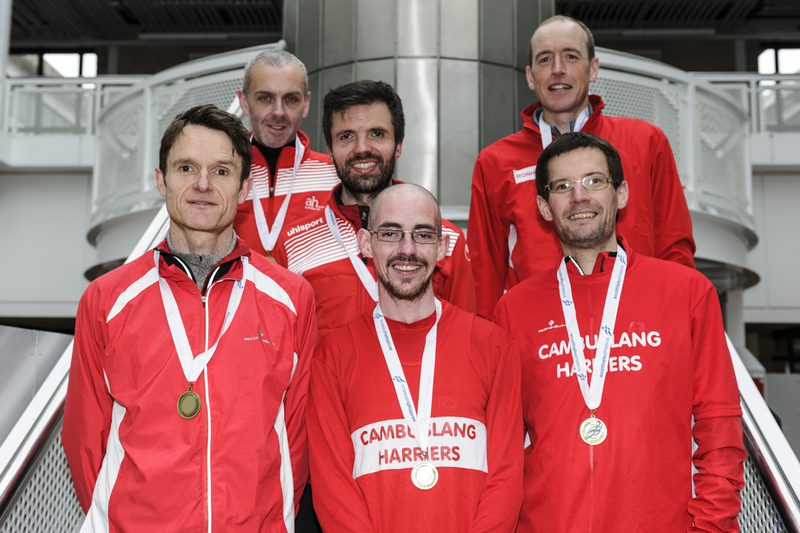 The Men’s Masters title was won by Cambuslang Harriers thanks to the efforts of John Murphy, Iain Reid, Michael Healy, Kenny Campbell, Justin Carter and Ben Hukins. Silver medals went to Edinburgh AC and it was Corstorphine AAC who took third place. 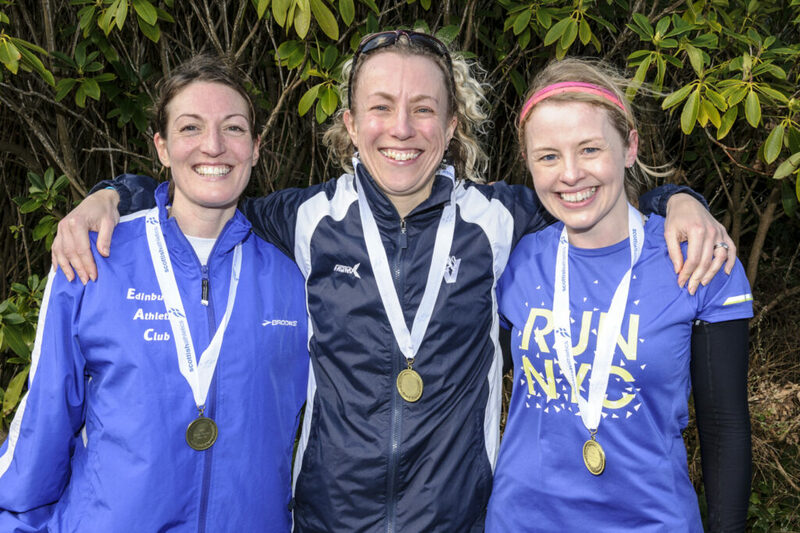 The Women’s Masters title was won by Edinburgh AC thanks to the efforts of Lyndsay Fraser, Jacqueline Rainger, Emma Laverie and Jennifer Maclean. Silver medals went to Hunters Bog Trotters and it was Linlithgow AC who took third place. 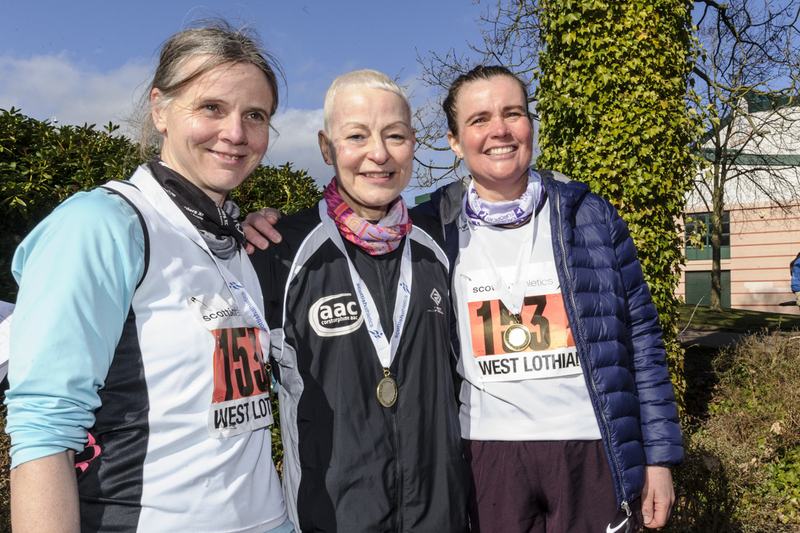 The W50 race was won by Corstorphine AAC thanks to the efforts of Janet Grigor, Fiona Carver and Sarah Ledingham. 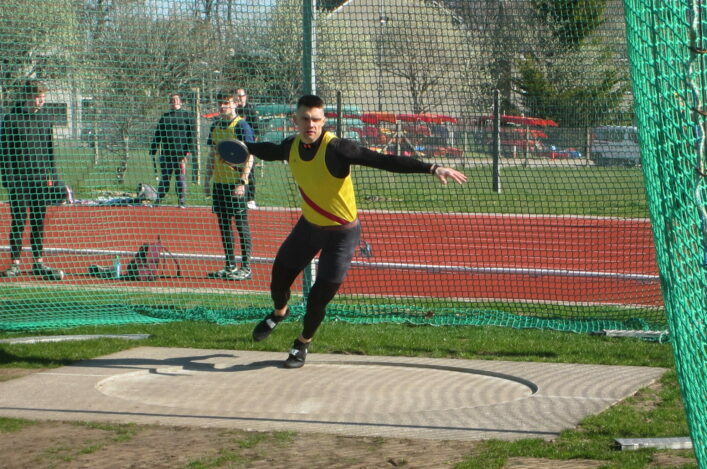 There were silvers for Fife AC and bronze for Edinburgh AC. 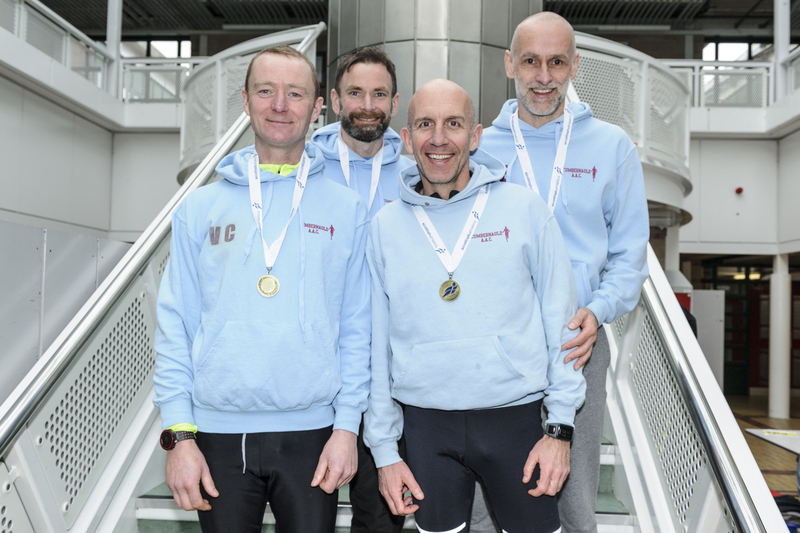 The M50 race was won by Cumbernauld AAC thanks to the efforts of Vincent Carroll, Howard Elliot, Paul McGonagle and Ross McEachern. Shettleston took the silvers and there were bronzes for Cambuslang Harriers.